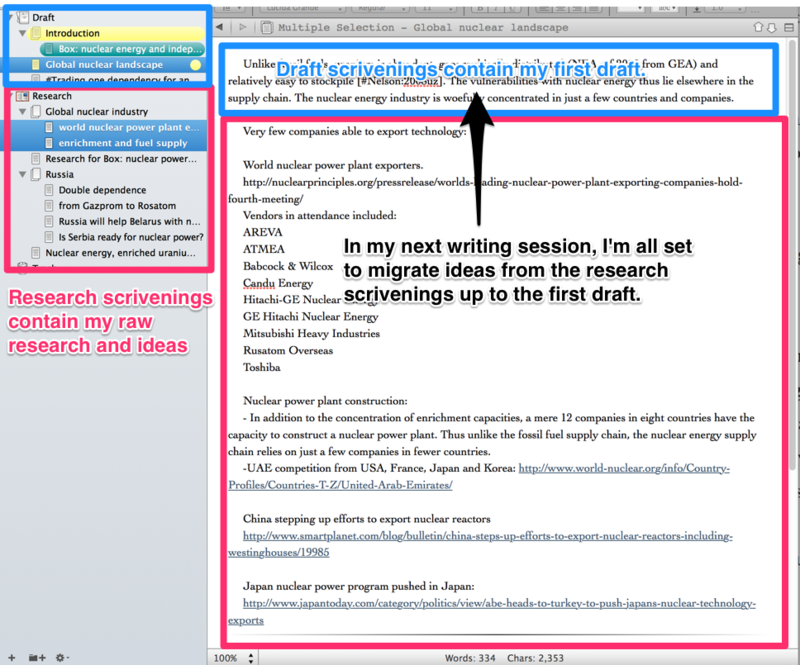 Recently, I’ve been writing shorter pieces and have developed a new workflow in Scrivener. At the beginning of a writing session, I work on the text which I’m prepared to write (i.e. I have all the references and ideas fleshed out in an outline). At a certain point though, I lose power with writing and find myself searching for references or outlining ideas. A workflow I’ve developed to deal with this dip in energy is to use the rest of my writing time to start organizing Research in my scrivener file. (The research tab is always there but I never knew quite what to do with it). This way, when I return to writing the next day, the document is downhill-parked and I can hit the ground running by using Scrivener’s multi-scrivening view to slowly but surely turn my raw research into text.